Can wine make you happy? After a long day filled with one of my least favorite parenting rites of passage to date (I’ll spare you the details), I needed some happy. A few weeks ago, I received two bottles of Pinot Noir from the Willamette Valley, Black Magnolia. 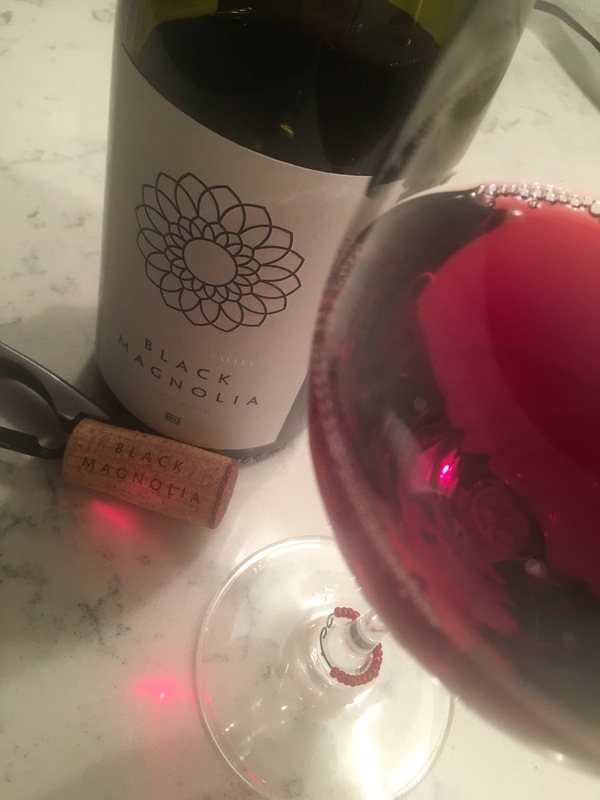 My first thought was that I liked the simplicity of the label, My second, “Is there a Black Magnolia?” And my third was, “Oh, there are two of the same bottles in here. Perhaps that was a mistake.” I reached out to the PR rep and her response was that she wanted to provide one to sample and one to enjoy later. My first happy from Black Magnolia. I try to save some to see how it holds up after being opened a day or two. Still, wow, this is a good glass of wine. It had lost a bit of its brightness but there was still plenty to carry the glass. Which brings me to Thursday. After all of the frustration from the day, I had no more room for disappointment. I needed a glass that would bring me some joy. Just watching it pour, it glistens and reflects violet and ruby, can put a smile on an oenophiles face. We grabbed our glasses and my notebook and headed into our room for our nightly unwind, which,that night, meant a movie in bed. It is a luxury to just sit and evaluate a wine, a well deserved one after my day. The nose abounds with red raspberry, dried rose petals, smoky burned sugar, and fresh herbs (sage perhaps?). The flavors continue and expand to Ranier cherry, a touch of rhubarb, a bit of cola. the tannins are subtle and remind me of a cherry pit (odd, I know, but true). The finish unfolds elegantly. A few sips in, my husband said, “Now, that is a good glass of wine. If you ordered a glass of this at a restaurant, you would be really happy with it.” I concur. So I looked up the price. $22. Which of course made me even happier. I finished the bottle last night, watching the Phantom of the Opera with my children tucked in close. I smelled my daughter’s hair and locked fingers with my son. They asked five questions between every sip, entranced by the music and the costumes. I thought of how the glass of wine gave me a little happy moment of self-care from a day of difficult parenting. I thought of how moments like these so immeasurably outweigh the hard days. I drank in their curiosity and was grateful. For moments of happiness, however we can get them. And even more, for the absolute joy in being their mother, hard days and all.